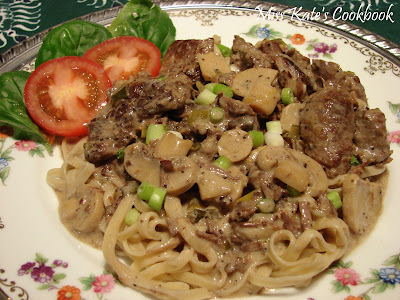 This is a wonderful recipe, full of flavor and it is easy to make. My family loved it and my next-door neighbor gave it four stars. Remove fat from beef and cut into thin strips about 11/2-inches wide and 2-inches long. Dredge with 2 tablespoons flour and salt. 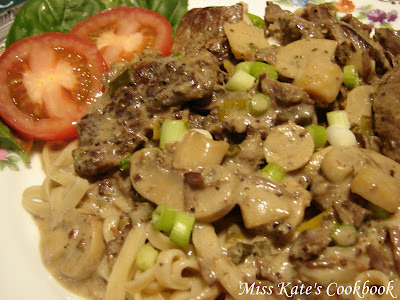 Heat butter over high heat and quickly brown onions, mushrooms and garlic. Add meat and brown. Sprinkle remaining 2 tablespoons flour over meat mixture in pan. Add bouillon and Worcestershire. Cook and stir until mixture boils and is thickened. Place over hot water in pan. Stir in sour cream and heat for a few minutes. Keep over hot, not boiling water, until ready to serve. Garnish with chopped parsley. After this is done you can leave it on the burner to simmer until the meat is tender. 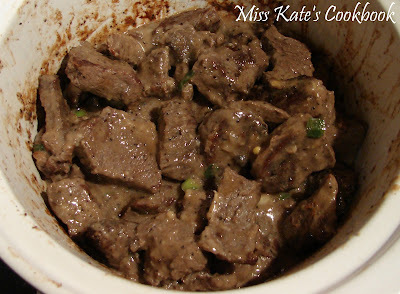 I put it into a slow cooker, it really made it moist and tender. Serve over noodles. Serves 4. Bon Appetite !